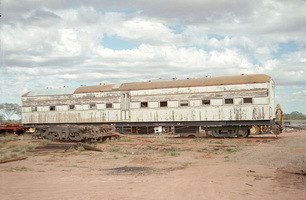 Ghan dining car built at the Port Augusta Workshops. Accomodating 32 passengers and sleeping 4 attendants. Easter 1964 Used on Australian Railway Historical Society special from Marree to Alberrie Creek. 1.10.1971 Converted for breakdown train work and used on the Central Australia Railway Recoded "NXDA". 13.2.1981 Sold to the Ghan Preservation Society.